The Ogallala Aquifer gets more shallow every year, threatening the livelihoods and homes of the people who live in the High Plains for Kansas and Colorado. 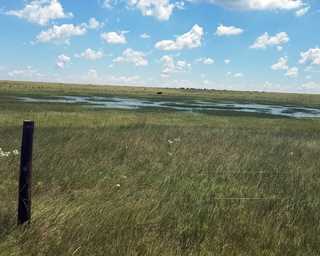 Ducks Unlimited is working with landowners and the Playas Lakes Joint Venture (PLJV) to restore playa lakes, which provide up to 95 percent of the water flowing into the aquifer through groundwater recharge. The seasonal ponds hold water from rainfall and runoff, creating temporary lakes. More than 80 percent of the region’s playas have been lost or degraded. DU and partners are restoring playas by cleaning out excess sediment, restoring natural hydrology, and adding filtering grass buffers that trap sediment. They are an important source of water for people and wildlife, providing food and rest to migrating waterfowl, cranes and shorebirds. Playas also reduce flooding and erosion damage by collecting and slowing runoff during intense rain events. The clay-lined, shallow wetlands improve the quality of ground water by filtering various pollutants, but they only preform these benefits if they are functioning properly. Ducks Unlimited and PLJV provide landowners tools to conserve playas on their properties. DU has been involved in putting on seminars for landowners and meeting landowners in their communities. Outreach and education have been key to the success of the program since many landowners have been unaware of conservation programs. Landowner participation in the seminars has been record-breaking. DU’s work with playas is science-based, and PLJV has assisted with the targeting of playa clusters with the highest conservation benefits. We continue to build this program and plan to build a long-term, sustainable program to conserve this important region. Playas are great water filtration systems. According to the Plays Lake Joint Venture, they keep fertilizers, herbicides and pesticides out of the groundwater. Studies show water reaching the aquifer through plays is of higher quality than that going through other pathways.